Laphroaig invites you to discover an exceptional product with this 30 years old edition distilled in 1985 and exclusively aged in barrels of Bourbon. A rich and complex whisky with nice fruity and spicy notes. 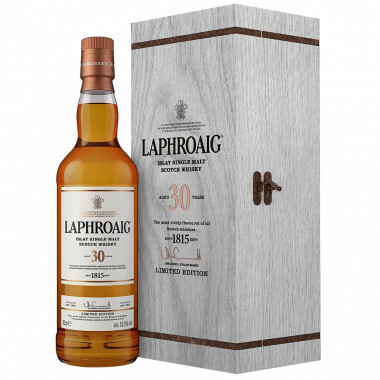 The Laphroaig distillery of Islay offers an exceptional product with its 30-year-old Laphroaig. From whiskies distilled in 1985 and matured for three decades in Bourbon casks, this rare Single Malt condenses 30 years of aromas and maturation in the bottle. 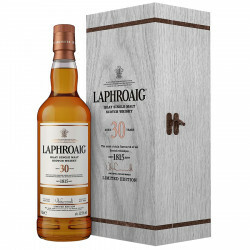 For John Campbell, master distiller of Laphroaig, the bottling in 2016 of this unique Laphroaig 30 years old edition distilled in 1985 and aged exclusively in barrels of Bourbon remains a "unique moment". With its 53.5°, this whisky is powerful, complex and very aromatic. It reveals very fruity notes of mandarin, mango, coconut with hints of almond and smoke tips. The set has beautiful spices of vanilla, coriander and ginseng. Nose: rich with notes of mandarin and mango enhanced by aromas of delicately toasted almond and grated coconut. There are touches of cedar, peat and smoked meat that give this whiskey a rich and original aromatic palette. A little water allows you to explore new horizons with hints of honey and apricot. Palate: balanced and very oily, it develops aromas of orange and green tobacco leaves with a nice balance of spices: vanilla, coriander, ginseng. Finish: long and complex with fruity notes and beautiful nuances.